There is no doubt that Indian food is still Britain’s most popular along with Chinese and Thai. The insatiable appetite for spicy food seems to be increasing among all age groups. A breath-taking range of food, with very clear regional differences, makes Indian cuisine a multi-dimensional tapestry which is as rich as it is colourful and as intoxicating as inimitable. 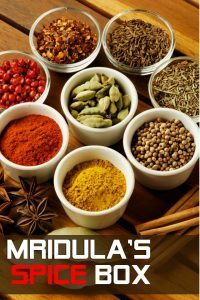 Spices are the blood in the veins of Indian cooking and knowing how to use them in different combinations and permutations is important in producing those captivating flavours. Knowing which spices work together is essential so is choosing the right meat or vegetables to go with the spices. Here is a brief description of how to use the basic spices that are used on a daily basis in an Indian kitchen. Cumin and coriander in whole form or ground are the two spices which can be used together in most dishes, but the quantity of each spice is also important. As a general guide, the Indian home cook will always use more coriander for its mild, mellow flavour, but cumin on the other hand is added in a smaller measure as it is more pungent, but essential in enhancing the overall taste and flavour. The ever-day spice turmeric, now declared a superfood, lies in the heart of Indian cuisine, but knowing when and how to add it to your curry is crucial. Excessive heat will ruin the colour and taste of turmeric; it should be added along with other ground spices on medium-low heat and cook for a minute or so to eliminate the that the raw taste of the spice. Both ground and fresh coriander along with a little cumin work wonderfully well with fish and poultry whereas just cumin used with clove, cinnamon cardamom, turmeric and chilli will produce a flavourful lamb or beef curry. No thickening agents are used in Indian cooking; the thickness of the sauce comes from slow cooking the onion until it the original quantity is reduced to about a quarter, tomatoes, tomato puree and nut pastes. I hope you find this useful, but please do get in touch with me if you have any queries regarding spices or indeed about Indian cooking in general.